Blaauwberg Nature Reserve has been awarded South Africa’s first Green Coast Status award and flag. The Wildlife and Environmental Society of South Africa (WESSA) has a Green Coast eco-label that is awarded to coastal sites where a sensitive species, habitat or cultural heritage site is sustainably managed, leading to increased tourism. The award was presented by WESSA to recognise the City of Cape Town’s Environmental Management Department and the Friends of Blaauwberg Conservation Area. These two organisations have been committed to preserving the unique flora and fauna along the Blaauwberg coastline. Communities also played a vital role in protecting the biodiversity of the area. “This award has certainly put our beautiful coastline on the tourism map and we are looking forward to welcoming more visitors to our nature reserve who are looking for experiences in adventure, outdoor living and ecotourism along our coastline,” says WESSA’s national coastal co-ordinator Robert Slater. “The City cannot uphold the Green Coast Status on our own. We need the support of our communities and organisations to ensure the success of the Green Coast Programme. We think particularly of our next generation of nature enthusiasts,” he adds. “There are opportunities for our schools to participate in our Green Coast Environmental Education Programme that will be hosted in partnership with the Transport and Urban Development Authority (TDA) Training Academy, which will provide young people with the opportunity to learn about nature and science in a fun and interactive outdoor classroom environment. I encourage our schools to make use of these opportunities,” urges Slater. 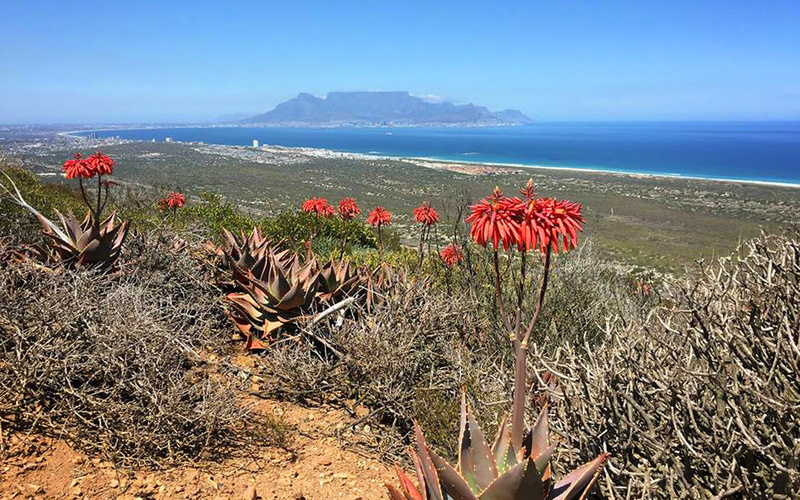 The Blaauwberg Nature Reserve includes 2000 hectares of pristine coastal landscape and is home to over 200 critically endangered plant species as identified by volunteers from the Custodians of Rare and Endangered Wildflowers (CREW). “As the most biodiverse city in the world, we have a responsibility to conserve and protect this unique biodiversity,” says Mayoral Committee Member for Transport and Urban Development, Councillor Brett Herron. Blaauwberg Hill at the nature reserve is one of the few viewpoints in the world where you can see two proclaimed World Heritage sites, namely, Table Mountain and Robben Island. The City’s Environmental Management Department and its implementing partner, the Friends of Blaauwberg Conservation Area organisation, will continue to actively monitor, maintain and ensure the accessibility of this 7km coastline with the help of the surrounding communities. WESSA will review its status annually.